A new ergonomic work table that was especially designed for their portable pneumatic grommet attaching machine to enhance operator productivity and comfort has been introduced by METALgrommets.com of Dighton, Massachusetts. 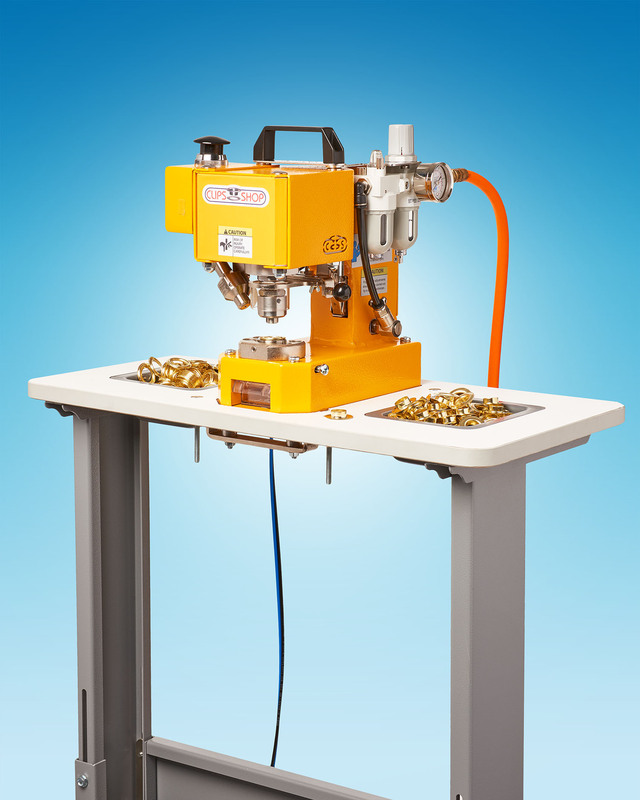 The ClipsShop® Adjustable Work Table for the CS-TIDY-41 Pneumatic Grommet Machine is designed to increase user comfort and accommodate the different physical dimensions and requirements of various projects. Featuring three machine-to-table surface position options including a recess to make the height of the grommet attachment surface flush with the table, there are two durable recessed molded acrylic bins to hold the grommets and washers. Providing telescopic legs and leveling feet, the ClipsShop® Adjustable Work Table top surface can be adjusted from 25” to 33” H and the installation bar for the foot pedal is tilted to increase user comfort and allows the pedal to be placed either on the right or left. This rugged work table has a 24” W x 12” D x 3/4” thick textured laminate wood top and powder-painted steel construction. The ClipsShop® Adjustable Work Table for the CS-TIDY-41 Pneumatic Grommet Machine sells for $395.00 (list) complete.